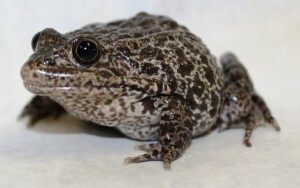 As the only endemic anuran of the longleaf pine ecosystem, the dusky gopher frog (DGF), Lithobates (Rana) sevosus, is uniquely capable of advocating for this vanishing and strikingly unique American landscape. As such, it is a species that should not be absent from any southeastern zoo. As the most critically endangered anuran in the eastern U.S., AZA facilities that seek to conserve amphibians should consider SSP participation. 100-200 DGFs exist in the wild. Their remaining, highly-degraded, habitat is threatened by a surge in residential development, and the relict in situ population has been infected with a new and poorly understood disease, (Dermomycoides) for which there is no cure. First and foremost, the purpose of the SSP is to maintain an assurance colony as a guarantee against complete extinction; long-term survival of the single wild population is quite uncertain. Second, the Dusky Gopher Frog SSP is a formal partner with the US Fish and Wildlife Service, with representatives serving on the Recovery Group. The Recovery Plan for DGFs includes the reintroduction of captive-bred frogs into the historical range. Additionally, captive specimens are used to raise public awareness of the status of this species and the plight of the longleaf piney woods. All photographs and information on this site are property of the AZA Amphibian TAG and may not be used without permission.